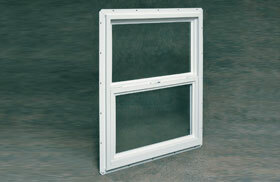 The "Traditional" single-hung utility window was developed for installation into garages, sheds, pole buildings, etc. where a maintenance free, aesthetically pleasing, low cost alternative to high maintenance wood windows is desirable. The "Traditional" single-hung window is constructed of polyvinyl chloride (PVC) which will not warp, peel or corrode and will provide years of trouble-free performance. The lower sash is double weatherstripped for weather tightness. The operable sash includes tilt latches on the meeting rail which allows the sash to tilt inward for easy cleaning and removal along with an interlock and a hook lock for added security. Available with optional insulating glass for enhanced energy performance. NVSH2430WD 24" x 30" 23-1/2" x 29-1/2"
NVSH2436WD 24" x 36" 23-1/2" x 35-1/2"
NVSH2448WD 24" x 48" 23-1/2" x 47-1/2"
NVSH3030WD 30" x 30" 29-1/2" x 29-1/2"
NVSH3036WD 30" x 36" 29-1/2" x 35-1/2"
NVSH3048WD 30" x 48" 29-1/2" x 47-1/2"